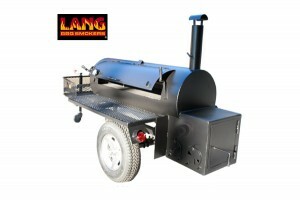 I am writing today to thank the Lang family for my beautiful 60 cooker that was delivered Wednesday. Throughout the process you all were very gracious when answering my questions, in particular with my concerns regarding the export paperwork. Thank you Sara for all of your help in that regard. You made everything very easy and I am happy to say that my new cooker is at home safe and sound, no problems. Thank-you to Benjamin Jr for helping me initially and for building a beautiful cooker. Everyone is very impressed with the quality of the welds and the overall build. My dad saw that brass fitting on the valve and smiled. Lastly, I really want to thank A.J or driving all the way fro G.A to deliver the unit, and also showing me how to operate and care for it. I called him during all hours and he was always gracious. Not a mark on the unit, he went out of his way to show me EVERYTHING. That man works his tail off and hope you guys appreciate him! Thank-you again. I hope that I can pass down my Lang to my boys one day. My only regret is not driving down myself to meet you all. Would have been nice to share some beer and stories with fine people like yourselves.